The Bird Banding Laboratory (BBL) is an integrated scientific program established in 1920 supporting the collection, archiving, management and dissemination of information from banded and marked birds in North America. This information is used to monitor the status and trends of resident and migratory bird populations. Because birds are good indicators of the health of the environment, the status and trends of bird populations are critical for identifying and understanding many ecological issues and for developing effective science, management and conservation practices. The BBL, since 1923 and in collaboration with the Bird Banding Office (BBO) of the Canadian Wildlife Service, administer the North American Bird Banding Program (NABBP), which manages more than 77 million archived banding records and more than 5 million records of encounters. In addition, each year approximately 1 million bands are shipped from the BBL to banders in the United States and Canada, and nearly 100,000 band encounter reports are submitted into the BBL systems. Following the Migratory Bird Treaty Act (MBTA) and its associated Federal regulations (16 U.S.C. 703-712), a Federal Bird Banding and Marking Permit is required to conduct all bird banding and/or marking activities. In the future, data will be submitted through the bander portal, but in the meantime use Bandit (The Information Manager for Banding Operations) to submit data. Why do we band birds? 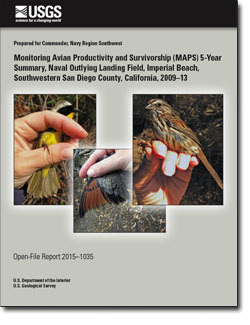 USGS contributions to science, management and conservation of birds. USGS publications associated with the Bird Banding Laboratory. For a complete listing of USGS publications, go to the USGS Publications Warehouse. The U.S. Geological Survey Bird Banding Laboratory: an integrated scientific program supporting research and conservation of North American birds; 2013; OFR; 2013-1238; Smith, Gregory J.
Diefenbach, Duane R.; Vreeland, Wendy C.; Casalena, Mary Jo; Schiavone, Michael V.
Collins, Daniel P.; Grisham, Blake A.; Conring, Courtenay M.; Knetter, Jeffrey M.; Conway, Warren C.; Carleton, Scott A.; Boggie, Matthew A.
Shaffer, Jill A.; Buhl, Deborah A.
Carleton, Scott A.; Martinez Del Rio, Carlos; Robinson, Timothy J.
Craig, Heather R.; Kendall, Steve J.; Wild, Teri C.; Powell, Abby N.
Peterson, Sean M.; Streby, Henry M.; Kramer, Gunnar R.; Lehman, Justin A.; Buehler, David A.; Andersen, David E.
Lynn, Suellen; Madden, Melanie C.; Houston, Alexandra; Kus, Barbara E.
Lynn, Suellen, Madden, Melanie, Houston, Alex, and Kus, B.E., 2015, Monitoring avian productivity and survivorship (MAPS) 5-year summary, Naval Outlying Landing Field, Imperial Beach, southwestern San Diego County, California, 2009–13: U.S. Geological Survey Open-File Report 2015-1035, 58 p., http://dx.doi.org/10.3133/ofr20151035. Palm, E.C. ; Newman, S.H. ; Prosser, Diann J.; Xiao, Xiangming; Luo, Ze; Batbayar, Nyambayar; Balachandran, Sivananinthaperumal; Takekawa, John Y.
Palm, E. C., Newman, S. H., Prosser, D. J., Xiao, X., Ze, L., Batbayar, N., Balachandran, S., and Takekawa, J. Y., 2015, Mapping migratory flyways in Asia using dynamic Brownian Bridge Movement Models: Movement Ecology, v. 3, no. 3. Paxton, Eben H.; Cohen, Emily B.; Németh, Zoltan; Zenzal, Theodore J.; Paxton, Kristina L.; Diehl, Robert H.; Moore, Frank R.
Cohen, E.B., Z. Nemeth, T.J. Zenzal, Jr., K.L. Paxton, R. Diehl, and E.H. Paxton. 2015. Spring resource phenology and timing of songbird migration across the Gulf of Mexico. In: Studies in Avian Biology, Edition: No. 47. Phenological synchrony and bird migration: Changing climate and seasonal resources in North America, Eds: Eric M. Wood, Jherime L. Kellermann, CRC Press, London. pp.63-82. The USGS Bird Banding Laboratory data are publicly available and can be explored and requested below. How banders do their job. A brief biography on the newest member of the BBL team. The BBL is collaborating with graduate students at the University of Baltimore to revise Reportband.gov and BANDIT software. Partners associated with the USGS Bird Banding Laboratory. FAQ associated with USGS Bird Banding Laboratory. How can I stop birds from repeatedly hitting my windows? This is a common problem. The bird sees its reflection in the window and thinks another bird is encroaching on his territory. One solution is to put a silhouette of a hawk in the window. That scares them off. Birding and nature stores sell paper cutouts that you can tape to the window.